The current situation regarding North Korea is playing right into what could be a bonanza for American interests in the Far East. The rhetoric coming from North Korea is laying right into American hands. If North Korea ratchets up the rhetoric, or if a missile test goes awry and heads towards Japan or South Korea, the missile will be destroyed. We are not intimidated by North Korea by any means. In fact, American military leaders are wringing their hands in anticipation of a ground war on the Korean peninsula. This would entail an artillery barrage of Seoul by the North Koreans that would cause terrible destruction and loss of life. Millions could die if the city in enveloped in a firestorm. This is the scenario of a North Korean attack. It's not their nuclear weapons, but their conventional weapons that South Koreans fear. They have had decades of preparation. The mountains overlooking Seoul are peppered with howitzers. I have seen them with my own eyes. When I was stationed in Korea we used to use a gun emplacement in the mountains to aim our radars for the Nike-Hercules battery I was stationed at. (That system was the for-runner for Patriot Pac3 system used today). It's no joke and a very serious situation. Don't think that our government is in any way dreading an attack from North Korea. The fact is" this would play right into the hands of the American Empire. While the United States is not publically supporting any provocations against the North Korean regime right now, they did send nuclear-capable B2 Bombers from the US to fly over the Korean Peninsula. This provocation really started the ball rolling. War games with the South Koreans that are still going on do not particularly sooth the North's nerves. 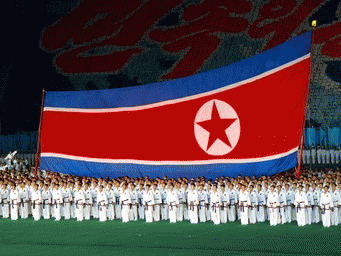 We know that North Korea is a nation that is in a precarious situation. The nation is on the brink of mass starvation in part due to UN sanctions over its last nuclear test. This is precisely why the North has ratcheted up its rhetoric. This is a way to control its people by preparing them for some kind of "patriotic war" against the US and the South Koreans. Unfortunately, while it may take the focus off of the peoples starving bellies, they can't keep the hype and patriotism going indefinitely. Sooner than later, if there isn't a war, the people will again look to their situation and the threat of instability will again take precedence in the people's minds. To understand the situation, John Kerry, Secretary of State, is heading to Beijing to discuss the situation with the People's Republic of China. Not only is Kerry heading there, but the Chairman of The Joint Chief of Staff of the armed forces is going there too. This is a way to get the Chinese to stay out of any future conflict. Of course this is the right way to manage a situation like this. I'm just glad that it's Kerry and not Hilary Clinton who will talk to the Chinese. The sad fact in this situation is that this kind of rhetoric only heats up the military preparedness of the United States armed forces. The kind of situation we see now will add billions, if not trillions into the Military -Industrial complex of the US. Even if the situation in Korea cools down, military spending will rise here in the US. This situation just gives credence for a hegemonic military that can destroy any adversary, anywhere in the world. This dictator in North Korea, while he may not realize it, is laying right into America's hands. He has probably done more for the defense industry in the United States than any publicity they could have imagined. This is a very sad situation for all the people on the entire planet. North Korea has most certainly jump-started another buildup of American military might in Asia, just as the administration said it would a few months ago. The US government actually stated that it was shifting its focus from the Middle-East to Asia. Now we can thank Kim Jung Un for helping the US to realize that objective. This is a time that all Americans have to be cautious in accepting any rhetoric or war-mongering from the right wing zealots in this country. Calls to bomb North Korea back to the stone-age will probably be heard from the right. This approach is not only contrary to what this nation stands for, it is also morally wrong. North Korea is in crisis. This crisis was engineered by the very same people that are facing the threat of a military move by that nation. We are not blameless, nor are Russia or China that also voted for sanctions against North Korea. If there is a war on the Korean Peninsula, it should be a UN action and joined by all the nations that sanctioned the regime for its nuclear policies. This effort should be joined by the Russians and the Chinese and not just lead by the US Alliance in Asia. If war becomes the result of a miscalculation by any player in this drama, it should not just be a US/South Korean effort. It would be in China's and Russia's best interests to join in a UN Alliance. If they stay neutral and stay out of the fray, the result will be a broadening of US Power in Asia and set the stage for hegemonic military power in Asia for the US. This will result in more military bases in Asia and a widening of the American Empire. The United States is saying it's not offering any provocation against the North Koreans and of course, this is a wise thing to do. Still, the military people in the US Government are licking their chops in anticipation. Understand that and you can understand human nature.